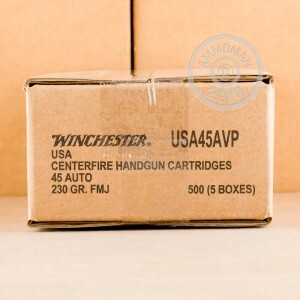 Get this 100 round value pack of ammunition from Winchester to keep your trusty .45 ACP handguns firing on the cheap without sacrificing on performance. These American-made cartridges use high quality components including clean-burning propellants, reliable non-corrosive primers, and reloadable brass to provide a dependable range load for serious shooting. Each cartridge in this value pack fires a heavy 230 grain full metal jacket bullet at a muzzle velocity of 830 feet per second. 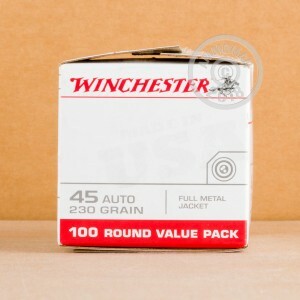 This 100 round pack is perfect for those not wanting to break the bank, but need a good range workout! 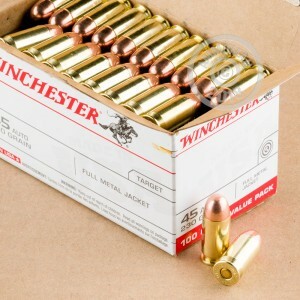 Winchester traces its origins back to 1866. A few years later, their center fire rifles were attributed with 'winning the West'. Spend more than $99 in one order at AmmoMan.com and get FREE shipping!